The following statement is the 2nd open letter mailed to the leadership of the International Union for the Conservation of Nature. It was originally posted here. Does IUCN Director General Accept Korea’s Environmental Destruction? Below you will find a disturbing history, prepared by 62 leading activist organizations in South Korea, who have, for many years, been trying to gain attention for environmental devastation taking place in their country. For example, on the idyllic Korean island of Jeju, construction has begun on a huge new navy base, that is rapidly devastating a region of rare beauty, vibrant soft-coral reefs, pure freshwater springs, numerous endangered species such as Jeju’s last 100 dolphins, and traditional sustainable cultures, and where police actions are brutalizing local populations who attempt to oppose the development. The letter below explains how the government is also pushing nuclear power plants on unwilling communities, as well as a horrific boondoggle known as the Four Major Rivers Restoration Project. Four Rivers has nothing to do with “restoration,” but, rather, is a sweetheart deal for the nation’s largest construction conglomerates to “straighten” Korea’s major rivers and its most loved riparian habitats into concrete canals. In an astounding display of irony, the International Union for Conservation of Nature (IUCN) will convene its quadrennial convention this September only a few kilometers away from where biodiverse habitats are being blasted to make way for a military base. As reported in the letter below, the IUCN’s Director General, Julia Marton-Lefevre, has unwisely turned a blind eye to the government’s actions and its distorted descriptions, and has even seemed, in some statements, to condone them. The IUCN has thereby made itself effectively complicit in the continuation of the ecological destruction. The question remains as to whether IUCN will make firm efforts to speak out and to challenge the Korean government on these dire matters, starting now. Please read the letter below, and then email the IUCN, demanding that it call on the South Korean government to put an immediate halt to the construction of the Jeju Island navy base, a halt to the construction of the Four Major Rivers Restoration Project, and a halt to Korea’s development of nuclear power. 1. In September 2012, the International Union for Conservation of Nature (IUCN) will organize the World Conservation Congress (WCC) at ICC JEJU in Jeju Island, which is expected to be attended by more than 10,000 people from over 1,100 organizations in 180 countries. We, civic environmental groups in South Korea, have a high regard for the international cooperation projects executed by the IUCN, which endeavor to help develop and implement policies that contribute to protecting the environment. We also recognize that IUCN is globally influential; the organization carries significant weight over the registration of UNESCO World Heritage Sites, sets criteria regarding internationally endangered species and develops conservation plans. We also respect the milestones achieved by the IUCN, including the Ramsar Convention in 1971; the World Conservation Strategy in 1978, which proposed the concept of “sustainable development”; the Convention on Biological Diversity in 1992, and the Resolution on Biodiversity, passed at the 1996 World Conservation Congress in Montreal. In addition, we recognize that it was the IUCN which enabled numerous technological advancements which are currently in use in the field to protect biological ecosystems, such as the Technical Guidelines on the Management of Ex-situ populations for Conservation. 2. Meanwhile, the Lee Myung-Bak administration has destroyed four major rivers, continues to blindly pursue nuclear power, and continues to forcefully construct a naval base at Gangjeong village on Jeju Island, despite fierce opposition, both locally and nationally. Against this backdrop, civic environmental groups and activists in South Korea continue to denounce the administration and are taking action against its destructive projects. We call for the South Korean government to halt its construction work at the four rivers and allow nature to reclaim it. We also oppose the Lee administration’s policy of promoting nuclear power under the guise of Green Growth and exporting it to the Third World. Furthermore, we are vehemently against the government’s execution of a plan to build a naval base on Jeju Island, which is destroying biodiversity and brutally violating human rights in the name of national security. 3. The World Conservation Congress will be held this year in South Korea, yet the Congress gravely neglects or misrepresents environmental and social conflicts in the host country. Because the Congress is financed by the Lee Myung-Bak administration and sponsored by industrial conglomerates, there is growing public concern that the WCC is promoting policies of the Lee administration without examining whether they are truly designed to preserve the environment. This year – 2012 – is the fifth, and last, year of President Lee’s tenure, in which his administration is taking advantage of the WCC to justify his poor environmental, peace, and labor policies. The South Korean government is using the convention to advocate for its questionable “Low Carbon Green Growth” campaign, its appalling Four Major Rivers Restoration Project, as well as its policy of prioritizing nuclear power and favoring corporate construction conglomerates. We are concerned that the IUCN Secretariat is not addressing any of the current environmental issues in South Korea among the themes for the upcoming WCC. Rather, Director General Julia Marton-Lefevre of IUCN faithfully endorses the Korean government and its dubious policies. 4. We civic environmental groups of South Korea raise this question: Are members of the IUCN and its Director General aware of the grave implications of the Four Major Rivers Restoration Project? Under the Lee administration, South Korean society has endured tremendous social tensions and environmental conflicts. The government has prioritized development at the expense of wreaking havoc on the environment and the health of its citizens. For example, in 2008, the 10th Meeting of the Conference of the Contracting Parties to the Convention on Wetlands was held in Korea. At that meeting, President Lee publicly declared to withdraw a plan to build a “Grand Canal” in Korea, only to re-allocate its budget to execute the Four Major Rivers Restoration Project, which has devastated the nation’s four crucial rivers. Sixteen dams were built at the rivers, destroying habitats for endangered species, critical biological diversity, and nearby wetlands. The rivers project violated several national laws, such as the National Budget Law, the River Law and the Environmental Impact Assessment Law. Construction contracts for the rivers project are reported to total around $900 million. Before its Director General asserted that the Four Rivers project was “reasonable,” the IUCN should have conducted an on-the-ground assessment of the project, which would have shown how it is, in fact, undermining the organization’s hard work of preserving biological diversity. In December 2002, the Technical Guidelines on the Management of Ex-situ populations for Conservation were approved at the 14th Meeting of the Programme Committee of Council, in Gland, Switzerland. Nonetheless, the South Korean government’s Four Major Rivers Restoration Project has been committing gross violations of IUCN guidelines, by decimating the habitats of several endangered species, including the Danyang aster (Aster altaicus var. uchiyamae). Does the IUCN, the international environmental steward, recognize that the rivers project has utterly destroyed a haven for migratory birds’ – the Haepyeong wetland located at Gumi City, Kyeongsangbuk-do province in a flagrant breach of the Ramsar Convention? Is the IUCN aware that organic farmers in Paldang, Dumulmeori, continue to defend their farmlands against forced evictions by the Lee Administration? 5. We respectfully ask for the position of IUCN on these critical matters. Is the IUCN aware that 3,000 university professors and five leading religious groups in South Korea oppose this project? The environmental organizations in South Korea are united in opposition to this project, demanding punishment of those responsible, the removal of the dam, and the restoration of the rivers. We respectfully ask for your official position on this dire situation. We, the civil environmental organizations of the South Korea, challenge the IUCN Director General’s position on the Four Major Rivers Restoration Project and therefore request the IUCN to clarify its position. 6. In addition, we express deep concern with the IUCN’s support of the construction of a naval base in Gangjeong village, Jeju Island. 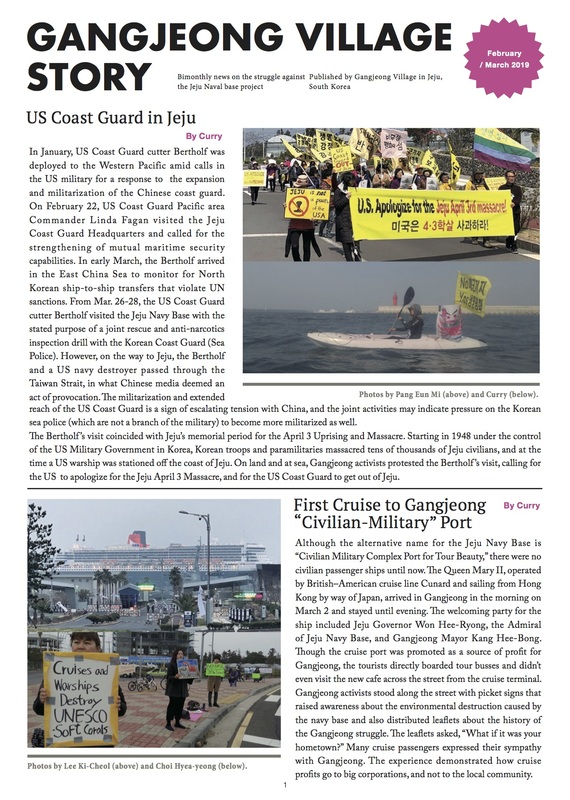 Last April, based on false information provided by the South Korean government, the IUCN issued an official position stating that “construction of the naval base in Gangjeong is valid according to legitimate processes.” It is questionable whether the IUCN put any effort into verifying the credibility of the data provided by the South Korean government. The IUCN’s statement on the Gangjeong naval base contradicts its earlier resolutions regarding the negative impacts of military bases on the environment. At the General Assembly in 2008, the IUCN adopted “the Recommendation for protection of dugongs in Henoko, Okinawa, Japan” and at the General Assembly in Buenos Aires in 1994, passed a resolution addressing the relationship of “military base to conservation area.” The IUCN’s objective to protect global ecosystems cannot coexist with the goals of increasing militarization at the regional or global scale. We oppose the IUCN’s position regarding the naval base project in Gangjeong village, on Jeju Island. Just to clarify, the naval base is being built at a UNESCO Biosphere Conservation Area (designated in 2002), and was designated a Cultural Protection Zone by the South Korean government in 2000 and 2004. In 2002 the government’s Ministry of Land designated it a Marine Ecosystem Conservation Area; in 2006, the government of Jeju Island designated it a Marine Provincial Park; in 2006, the Ministry of Environment designated it an “Ecological Excellent Village”; in 2007, the Jeju Island government designated it an Absolute Retention Coastal Area; and in 2008, the Ministry of Environment designated it a Natural Park. We ask you to please clarify how the IUCN would consider a project as “legitimate,” when the government mobilizes both public and private police forces against residents who have committed no crime other than to object to the project’s desecration of this precious conservation area. Gangjeong village in Jeju is an area that must be conserved in accordance with the values of the IUCN. That would mean that the military base construction must be blocked. The IUCN must actively seek to halt the naval base construction at Gangjeong and to restore and preserve the area’s natural ecosystems through a resolution at the WCC General Assembly. 8. We, in the spirit of peace on our Korean peninsula, are besieged by the South Korean government’s arbitrary administration of law in regard to the environment, and its dictatorial push for national projects for whom only the nation’s largest corporations benefit. Since President Lee took office, his administration has expressly weakened laws which had protected South Korea’s environment. South Korea environmentalists are gravely concerned that the government will take advantage of the WCC General Assembly proceeding this September in Jeju to advance its illegitimate national projects. We therefore demand a clear explanation of the IUCN’s position regarding the Four Rivers Restoration Project and the Gangjeong Naval Base project. We formally request the IUCN and the 2012 WCC Organizing Committee’s clear position and response, which will be a central factor to the position taken by the Korean civil environmental organizations at the WCC General Assembly. 9. In keeping with the IUCN’s prodigious achievements toward preserving the biodiversity of the planet, we expect the IUCN and the WCC Organizing Committee to show significant efforts to resolve environmental disputes and related social conflicts in the Republic of Korea, the host nation of the WCC. As funicular cable cars on the sacred mountains of Jiri-san and Seorak-san threaten Asiatic Black Bears; as sustainable farmers from Gangwon province struggle with the seizure of their land to build a golf course; as tidal power plants at Incheon Bay and Garolim Bay threaten the livelihoods of local fishermen; as residents battle nuclear power plants in Gori, Youngduk and Samcheok; as the farmers and fisherpeople of Jeju Island cope with the destruction of their reef and farmland in order to build a navy base; as country folk struggle to exist after their villages were subsumed by water to construct dams on Mt. Jiri and Youngju; as laborers strike against brutal working conditions at SSangyoung Motors– As these manifold violations take place, we shall, with our partners in the international community, take actions to expose the daily brutality levied upon the environment and the people of South Korea, and to correct the wrong doings of the Lee Myung-Bak regime. We wish for a peaceful resolution to these many environmental and social conflicts, and request that the IUCN and the WCC Organizing Committee clarify their position on these issues as soon as possible.